How interesting, Faust says the LDS Church and not Jesus should come first and foremost in the hearts of Mormons. Why am I not surprised? The statement by Mr. Randquist is a slap in the face to all of our various Christian churches. Faust obviously encourages Mormons to put the LDS Church foremost in their hearts because he (erroneously) believes that the LDS Church will guide people to Jesus. Mr. Randquist's disassociation of Jesus with churches indicates an apparent belief that Jesus cannot be found in an earthly church! If you choose not to belong to a Christian church, Mr. Randquist, that's your prerogative but please don't push your erroneous assumption on the rest of Christianity who believe that Jesus can be, and is found in our churches! Grace and peace to you in Christ. I don't think Matt was saying that Christ isn't in the visible flesh-and-blood church. In fact, I'm fairly certain he'd agree with us that one disassociates Christ from his bride to their peril (1 John 4:6). I think there is something to be said, however, about the Christ-belittling, idolatrous Mormon focus on church and family. One can tell from Mormon publications and from interaction with Mormons that the typical affections are sweet for the church but maudlin for the Creator God-man Jesus Christ. That's Matt's point. And oh how brutal are lovers, families, and churches that dissuade one from Christ! How strange that one line, one sentence, could be so twisted. Where on earth did I ever say Christ could not be found in Christian churches??? I never said anything that could come close. All I wrote was that I was not surprised that someone in the LDS Church would want Mormons to put the LDS Church, and not Jesus, first into their hearts. This guy wrote "If you choose not to belong to a Christian church, Mr. Randquist, that's your prerogative......"
Where did I ever write that I belonged to a non-Christian church? 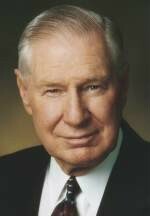 Why does Mr. Cluff feel, and I emphasize 'feel' as opposed to 'think', that Mr. Randquist is slapping the face of the Christian church? Rather than conjecturing on the motivation for Mr. Cluffs irrational response, it may better to simply point out a reasonable assumption for Mr. Randquists comment. Mormons place a higher priority to their Church than to Christ. It seems unfair to Mr. Randquist to assume anything else from his comment. And especially unfair to assume he is being physically abusive towards the Christian Church. What makes this even stranger is that I am sure Mr. Cluff would agree that Mormon's falsely place a higher priority to their Church than to Christ. Please accept my apologies for misunderstanding your statement. It sounded as if you were cheapening our Christian churches by saying that a Christian church organization (which certainly manifests the presence of the Lord) could not be worthy of our hearts and foremost affection. I understand now that you apparently belong to a Christian church yourself which you believe manifests the presence of the Lord also. So long as you understand that your church exists as a conduit to Jesus, there is nothing wrong with saying that your "church should come first and foremost in the hearts of its members". Coming from the mouth of Faust, of course this is blasphemy. But coming from the mouth of you, me, or any other Christian, this statement is perfectly legit. So I ask you, Mr. Randquist, does your church come first and foremost in the hearts of it's members? If it doesn't, then perhaps it's not so much a problem of what was said by Faust but rather a lack of the presence of Christ in your church. And if this is the case then perhaps you should consider joining a Baptist church wherein the presence of the Lord is plainly manifest. Thank you for your email message on Rob's site regarding Mr. Faust's statement. As a former Mormon, now born-again Christian attending a Christian church, I can vouch that the church should be an important part in every believer's heart and life, however it should not be the only part of the Christian's life. I know of many who go to Christian churches and get involved in all the activities, the movie trips, the bowling, church basketball, without really taking the time to get to know Jesus. Yes, my church is a conduit of Jesus, a small but important part in the Body of Christ. Where Faust and Mormonism are in error is that they hold that ONLY the church should be first and foremost in the hearts of believers. Mormonism seems to view having a personal relationship with Christ outside the LDS Church as impossible. For Mormons the church is everything. For Christians the church is but one of many ways that the presence of the Lord is plainly manifest. It is by no means the only way, as personal Bible study, prayer, witnessing also manifest the presense of the Lord. Honestly, in Mormonism, the LDS Church is nothing more than an idol replacing Christ, for Christians, it is a means of grace and support to help us stay strong in Christ. As for joining a Baptist Church, denomination wise I am a Methodist, but prefer saying that I am a born-again Christian who fellowships with the United Methodist Church. Admittedly, I was a little harsh in my judgement of Mr. Randquist's attitude toward our churches (although my judgement was not entirely incorrect). But my point is simple. If you truly believe that your flesh-and-blood Christian church is a conduit or vehicle to guide souls to Christ Jesus, then there is nothing wrong with saying that your "church should come first and foremost in the hearts of it's members". The only way that this statement could be inappropriate or harmful is if your church is INCAPABLE of fulfilling it's purpose of guiding souls to Christ (like Mr. Ranquist has described his church to be with all the unedifying movie trips, bowling, basketball games etc). No wonder Mr. Randquist is disturbed by the notion of his Methodist church coming "first and foremost in his heart". Who wouldn't be? According to his own description, Methodsim appears to be more of a distractive conduit to worldly entertainment than a true conduit to Christ. Do you consider YOUR church to be incapable of fulfilling it's purpose too, Mr. Setian? If so then I can certainly understand your reluctance to put it "first and foremost in your heart" too. Mormonism is guiding people to a lifeless idol. Don't you see that's what makes it wrong for the Mormon president Faust to say what he did? But Baptist churches are guiding people to CHRIST. So as far as this whole issue goes, it's not so much WHAT was said that makes it wrong but WHO said it that makes it wrong. I would feel perfectly comfortable telling my Rockport brothers and sisters that their "church should come first and foremost in their hearts" because I have supreme confidence in it's ability to fulfill its purpose of guiding people to Christ the Lord. Believing any differently would be to cheapen the value of my church and also to disassociate Christ from it too! Now what's so "strange" or "irrational" about that? So I ask you, Mr. Setian, do YOU too have a problem claiming that YOUR "church should come first and foremost in the hearts of it's members", like Mr. Ranquist obviously does? If you do then you also have disassociated Christ from his bride to your own peril (1 John 4:6)! Perhaps it's time for you and Mr. Randquist both to join a Baptist church which is fully capable of fulfilling its purpose of properly guiding souls to Christ the Lord. Your judgment was entirely incorrect! You see I do have a problem with people who say that their church should come first and foremost in the hearts of it's members, no matter what the church. The reason is that the church is a creation, whereas Jesus is the Creator. I don't believe it is wise to place creation before Creator, that is what the Wiccans do and it is in my view idol worship. Even if the church leads thousands to Christ, it should never be placed first ahead of Jesus, absolutely never. Let me repeat what I said in a previous post, and I felt I was more than clear on the matter, "I know of many who go to Christian churches and get involved in all the activities, the movie trips, the bowling, church basketball, without really taking the time to get to know Jesus." I never once said it was my own church, or a Methodist Church in general. So when you say that it was my church that did those things I was a bit surprised as I never said it was mine, only that "I know of many who go to Christian churches.........." That includes Baptist as well as every other denomination. If you walked into my church I doubt you could imagine it being involved in any of those activities. Many are old-fashioned Methodists, believing that dancing and card playing are sinful (a belief I share) and most are well over 60 years old. I doubt anyone in my local church will be playing a basketball game anytime soon. A word on Methodism is needed now. It is leading people to Christ. Whereas the church is declining in the United States, it is the fastest growing church in Africa and to my knowledge one of the few churches allowed in the Middle East. I myself am involved in three types of ministry. One is my witnessing to cult members such as Mormons, Jehovah's Witnesses, Catholics, and Muslims. The second is my witnessing the name of Jesus to all others, including Christian churches that I believe to be in error (the Episcopal Church comes to mind). I have often said that there is not enough Bible preaching in our churches and too much commentary. I therefore view part of my ministry as strengthening the church and I have the opportunity to speak to various churches, some of them Baptist. I always stress that the Bible should be something preached and taught and not something to keep the book holders on our pews full. The third form of ministry I do is the ministry of witnessing against Communism. Too many believe that Communism is dead, yet 1/5 of the world remains imprisoned by that enemy of God. Many in our own government support Communist organizations in the name of global peace. Christianity is growing fast in China, yet the Communists continue to harass and even kill those who accept Christ as Lord and Savior of their lives. I am proud to say that I help smuggle Bibles into these nations and I look forward to witnessing Christ crucified on the streets of Havana, free from Fidel Castro's iron grip. Yet it is Jesus that comes first and foremost in my heart. I have no problem if a Christian puts his or her church second, but first place is reserved for the Son of God in my heart. With regards to James E. Faust, I pray that he accepts Christ as his Lord and Savior. I know of many Christians who join the Mormon Church for various reasons, most because of social or financial reasons, and I believe some Mormons will be in Heaven, because many who don't accept the LDS beliefs and hold to Christian beliefs and for their own reasons believe they can reform the LDS Church. However like the Jehovah's Witnesses and other cult groups, there are just way too many wrong things with Mormonism for it to be considered Christian, plain and simple. LDS people may be nice and clean cut and good loyal American citizens, but theologically they are just plain wrong. P.S. Out of curiosity, what kind of Baptist are you? Are you Southern Baptist, American Baptist, Independent Baptist, Seventh-day Baptist??? Just curious. --- "I do have a problem with people who say that their church should come first and foremost in the hearts of it's members, no matter what the church. The reason is that the church is a creation, whereas Jesus is the Creator." --- "Even if the church leads thousands to Christ, it should never be placed first ahead of Jesus, absolutely never." --- "Yet it is Jesus that comes first and foremost in my heart. I have no problem if a Christian puts his or her church second, but first place is reserved for the Son of God in my heart." Well Mr. Randquist, you've made it painfully obvious that my initial judgement of you was absolutely correct. Regarding Christ and his Church, all of your disassociative "first place, second place" business is nonsense. I feel it a pity that I am compelled to open the Word of God and teach you of the sanctity that the Lord places upon his marriage relationship. So Mr. Randquist, whence cometh the gross distinction that you draw between Christ and his Church? You speak of the union of the Lord's marriage as if they remain TWO COMPLETELY SEPARATE AND DISTINCT entities although the Bible clearly proclaims them to be ONE FLESH! Your view of the Lord's marriage to his church is one of "separation" at best, DIVORCE at worst! You speak of the Lord's bride as if she were some poor, cheap widower unworthy of the affection and devotion of her husband, even unworthy to be considered ONE with Him. So again, I declare that your view is a slap in the face of the bride of the Lord (which plainly translates into a slap in the face of the legitimacy of our various Christian churches)! I find your disassociation of Christ from his church to be borderline blasphemy. Can one really find himself under the grace of God who treats His bride with such dishonor and disrespect? You need to stop and humbley and prayerfully consider the true status of your salvation. If you were a Baptist (any sort of Baptist) then you would not be dishonoring the Lord's bride like Methodism has taught you to do. It follows then, had you been Baptist instead of Methodist, your salvation would not be in question. On authority of the Word of God, I cannot allow you to "put asunder" the marriage union that exists between the Lord and his Church. So, along with Mr. Shafovaloff, we both call you to repent of your careless judgement of the Lord's virtuous and holy bride. The alternative to strict repentance is to suffer the perilous consequence of your willful disassociation of Christ from his church. Mr. Shafovaloff and I both will be praying for you. Thank you for your response. I must say first and foremost that you have your views and I have mine, and I don't believe you will convince me that your views are correct. I am certainly not disassociating the bride of Christ from our Lord. I believe the church (the New Jerusalem) to be the bride of Christ mentioned by John in Revelation 12:2. The Bible speaks of a New Jerusalem as well in verses nine and ten of that same chapter. In Ephesians 5 we read "wives, submit yourselves unto your husbands, as unto the Lord." Here we read that the wife is to submit to the husband. In verse 24 of that same chapter we read "Therefore as the church is subject unto Christ, so let the wives be to their own husbands in every thing." What needs to be done is we need to think through our doctrine here. If something is to submit to something else, then that shows that they are not both in equal standing with each other. The military submits to the President of the United States, thus we can see that they are not one in the same and thus not in equal standing with each other, but nevertheless they are in standing and in a relationship. It is not I, but you who made the disassociation of Christ from his church an issue by proclaiming it a marriage relationship. Both parties are separate from one another in terms of the groom is the groom and the bride is the bride. Christ did not marry himself. Mark 10:7-9 is metaphorical in its wording. A husband and his wife can not literally become one person; after all we are not made of Jell-o but of flesh, blood, and bones. You wrote "You speak of the union of the Lord's marriage as if they remain TWO COMPLETELY SEPARATE AND DISTINCT entities." I did so because they are two separate and distinct entities. I could easily point to my chest and say "I am the church" but that doesn't mean that I am Christ. From your reasoning I could point to myself and say that I am first and foremost in my own heart, because I am the church, but that sounds just a little too New Age for my liking. If you find my belief regarding this matter akin to blasphemy then you have the right to do so. "In essentials, unity... in non-essentials, liberty... in all things charity." I don't believe this matter to be essential to my salvation but as a non-essential so I will choose to do what Wesley taught and that is to "think and let think." I want to make another point. If I walk into a church it does not automatically make me a Christian. If it did then Rob might as well end this website because Mormonism is a church, hence the name CHURCH of Jesus Christ of Latter-day Saints. Walking into a church no more makes me a Christian than walking into McDonalds makes me a Big Mac. My good works, my church denomination, my doctrines on non-essential matters will have no bearing on my salvation. I have accepted Jesus Christ as my personal Lord and Savior. I have accepted Christ's sacrifice on the cross as payment in full for the demands of justice that my sins require. I sin because I am a sinner; it is part of my nature. I am not a sinner because of my sins, but I sin because of the fact that I am a sinner. Because God's laws are eternal, as He is, my sins (which are breaking those laws) require an eternal punishment and only the eternal God, Jesus, could satisfy the demands that justice required. Christ's death on the cross reconciled me back to God when I accepted the free gift of salvation. I know I am saved, there is no question. The reason I know I am right with God is because I have a Savior. I am saved by grace, not by works, or else I would boast. Jim, I want to make it clear that first the Methodist Church is a Christian Church that does lead people to Christ and thus to the giver of eternal salvation. Methodism doesn't teach anything that dishonors our Lord and I believe if Jesus walked into the Methodist Church I worship in, He would feel right at home. You wrote "It follows then, had you been Baptist instead of Methodist, your salvation would not be in question." Oh really? I have nothing against the Baptists, great people, but your statement makes it sound like being Baptist automatically means you are saved and being Methodist only gives you a 50/50 chance. I can only imagine what your views regarding the Presbyterians or Lutherans could be, or Calvary Chapel or even the Anglicans. When I die, I will face judgment (Hebrews 9:27), but because I am a born-again Christian, it will not be a judgment of Heaven or Hell but of rewards based on what I did with Christ and His gospel while I was alive. I don't believe the Lord will ask the angel holding the Book of Life what denomination I belonged to. I doubt the Lord will say "Gee Matt, you were a Methodist, I can't let you in, sorry." Grace is a miracle in my view. The overwhelming quality of God is love, and "God so loved the world that He gave His only begotten Son..." God could have just looked at mankind with disgust and not sent His Son, Jesus, to die for us. Yet God loved us and knew that "there is none righteous, no not one." God knew that "all have sinned and come short of God's glory" because God is the one who said it through the Apostle Paul in Romans 3:23. When you wrote "You need to stop and humbly and prayerfully consider the true status of your salvation" I could only think, "I have, and I am saved by grace, praise the Lord!" Grace is a miracle. God didn't have to come down from Heaven and die on a cross for me. God didn't have to give me a gospel of grace to believe in. God could have made my works count toward my salvation but He did not because He knew I was not capable of atoning for my own sins. Jim, my salvation is not in question because I am a member of the United Methodist Church. If it were, then so would George W. Bush's salvation (Bush is Methodist), and millions of others. Nearly 15 million people around the world call themselves Methodists in one of several Methodist Church's. My salvation is not in question because Christ is my Savior and Lord and by grace I have been saved. On authority of the Word of God, I cannot allow you to make works and church denomination necessary to justification in God's sight (Ephesians 2:8-9). You wrote "So, along with Mr. Shafovaloff, we both call you to repent of your careless judgment of the Lord's virtuous and holy bride." First, I didn't know Aaron was writing this email with you, I will let him write his own words to me. Second, the Lord's "virtuous and holy bride" is not virtuous at all. The church is full of sinners! Methodist Church included!!! I will even guarantee that every member of every Baptist church is also a sinner. I have a hard time attaching the words virtuous and holy to something that is anything but. Jesus Christ is not the church and the church is not Jesus Christ. Mr. Cluff, it wasn't very kind of you to put words into my mouth. And I hope I would not speak so abusively and unkindly toward my brother in Christ, Mr. Randquist. It seems as though you are partaking in hypocrisy, because you so vehemently defend the union of Christ and the Bride, and yet you speak abusively and impatiently against Matt, who IS the Bride, and therefore, in one sense, is Christ. Remember, Jim, that Jesus associated "the least of these" with himself in Matthew 25, so in practice, when you speak caustically and impatiently with "the least of these", you do so to Christ. You said: "You need to stop and humbley and prayerfully consider the true status of your salvation." Matt is a brother in Christ. If you want to best promote your doctrine of the union between Christ and the Bride, then show it by interacting humbly and patiently with other disciples of Christ. OK, I find it pointless to let this discussion go further, unless of course you have anything specific to say about Faust's comments other than that already stated. I disagree with Jim Cluff, and think the Church is much larger than his independent Baptist movement, and I don't agree with his absolute identity of Christ with His Church. If something leads to Christ (a song, the Bible, a church member or a church, etc. ), then by definition it takes a secondary place to Christ, "who is over all, God blessed for ever" (Rom. 9:5). I don't think Jim made his case, but it served as a good illustration for how LDS might think, even if a Baptist of sorts gave it. This isn't a blog site or a typical discussion board; it's more like a newpaper, and it's my discretion to edit and moderate my site as I find best. I've allowed both sides to be sufficiently expressed. I was just looking at the discussion board of your website and found the thread about James E. Faust’s comment on putting the church first and foremost in one’s heart. What ensued was an argument between three men, two of which were Christians, and one of which was a Baptist (who may have been a Christian) who made a point of attacking one of them over his point. I imagine you already know this, but since it’s not pointed out on your site, I thought I would like to state that not all Baptists think this way! I have been a member of a Baptist church for several years now. I completely disagree with James E. Faust’s statement, but not just because it was in reference to the LDS Church! I disagree with it because it puts their church before Christ. Indeed, I agree almost completely with the statements of Matt Randquist and Aaron Shafovaloff and hardly at all with the statements of Jim Cluff! Plus, I don’t think I know anyone in my Southern Baptist church who would agree with Mr. Cluff’s statement! Just thought I’d clear that up! It’s come to my attention that Mt. 6:33 may be used to legitimize what Faust said in this article about keeping the Church foremost in one’s heart. If Mt. 6:33 tells us to seek God’s kingdom first, then why should we have a problem with identifying Christ and His Church? Again, as Aaron Shafovaloff has already pointed out, and everyone else here has agreed with, "[O]ne disassociates Christ from his bride to their peril (1 John 4:6)." The problem with what Faust said is that he was valuing (an internal heart matter) all the externals the same as the Pharisees did in attempting to obtain their righteousness. For him, and other LDS, it’s about keeping the list: "family home evening, daily family prayer and daily family scripture study." This is what Matt Randquist, as a former Mormon, was reacting to much like Jesus did with the Pharisees. Ranquist and other Mormons know that LDS Scripture teaches that having the Father and Christ in one’s heart is an old, false sectarian notion, since they are both men with flesh and bones (D&C 130:3 and 22). Every former Mormon will report how LDS are more enamored with Joseph Smith, the other LDS prophets, their temple, family home evening, their missionary program, their Relief Society, etc., etc. than they are with Christ. Christ is given lip service, but not the lip service that would even address Him in a prayer. Mike Norton of JosephLied.com (another former Mormon) put it to me this way: it's like when a pizza guy delivers to the door, and a Mormon would go on and on about how good looking the pizza guy is, how good looking the car is that the pizza guy delivers in, how courteous the pizza guy is, how enjoyable the phone service is where the pizza is made, etc., etc. By the time the Mormon gets the pizza inside to eat it, it's cold. The Christian on the other hand is primarily concern with simply getting the pizza. To the Christian, Jesus is the pizza. The delivery guys or messengers and their services are nice, but they are there to promote the Pizza. Putting one's focus on the service rather than the product is getting the cart before the horse as it were. Thus, if the Rock is not first and foremost in one’s heart (and of course that entails God’s kingdom or Christ’s body/bride), then all the externals of any church institution are an ultimate waste of time.